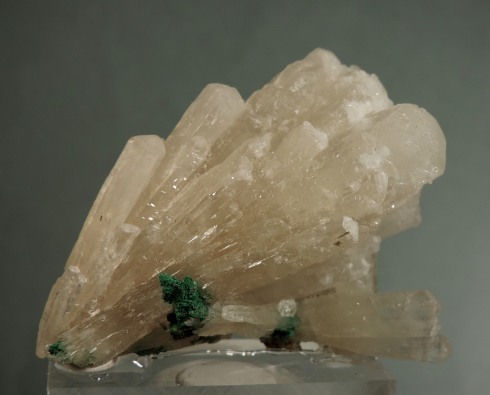 Highly lustrous, off white (very slight hint of color) prismatic crystals of nicholsonite, the zincian variety of aragonite in a radiant formation, with minor malachite attached to the crystals. Some of the tips of the crystals are actually gemmy! Ex Herb Obodda private collection. Azurite – Ex S. Maslansky Coll. 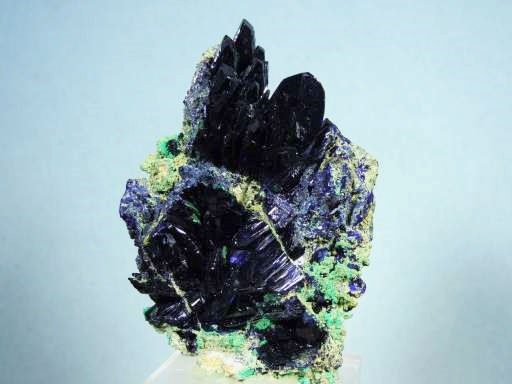 A magnificent specimen of lustrous, deep blue crystals of azurite in parallel growth, with some matrix and minor malachite attached at the back. 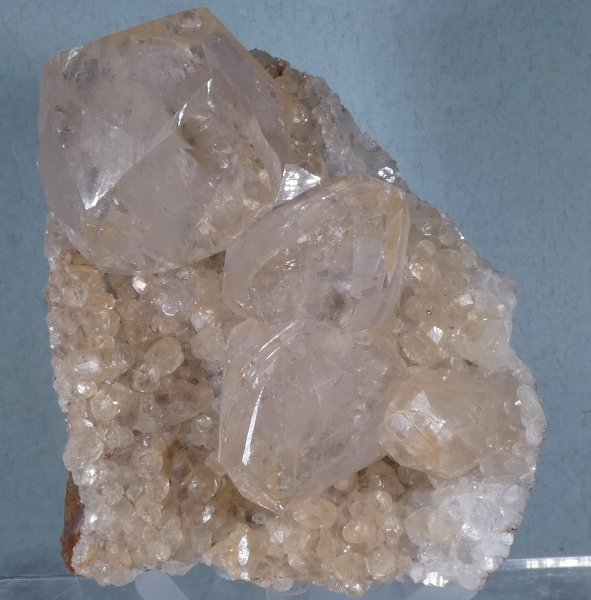 The crystals average between 6 and 7 cm and are perfectly terminated and in excellent condition. A major Tsumeb azurite acquired by Steve from Larry Conklin in 1994. The specimen was mined in May 1990. Very sharp, Tsumeb deep blue prisms of azurite to 3 cm scattered and in parallel growth, on a matrix that is sprinkled with malachite. Azurites (especially from Tsumeb), are rather difficult to photograph. I assure you that the quality and luster of the crystals as well as the definition and condition of this specimen is exceptional. 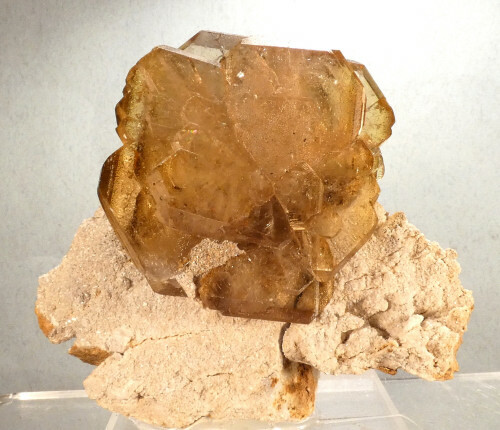 A group of lustrous transparent golden compound crystals of barite on matrix. Displays wonderfully. Beryl Var. Bi-colored in a Biotite cast after Beryl. Ex H. Obodda Coll. 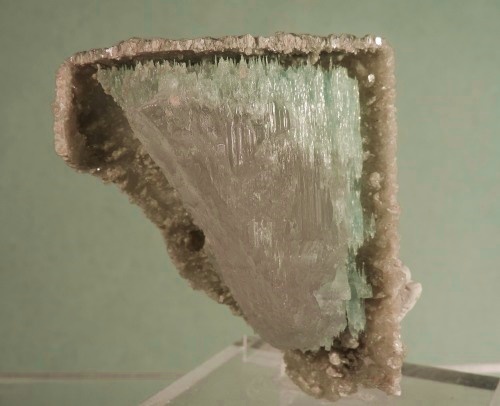 A bi-colored naturally etched beryl crystal (pastel blue and pink) sits inside a pastel greyish cast of biotite crystals. Herb’s label says aquamarine, but I believe the center of the crystal runs towards pink morganite. One of the most unique specimens I have ever encountered. * For some reason I could not get blue color correctly on photos, they appear greener than they are, instead of blue. 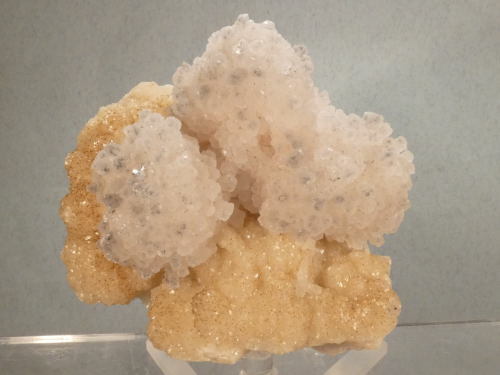 A group of very gemmy, highly lustrous light tan crystals of calcite on a matrix of smaller calcites. One very minor blemish on one edge of the crystals, otherwise perfect.